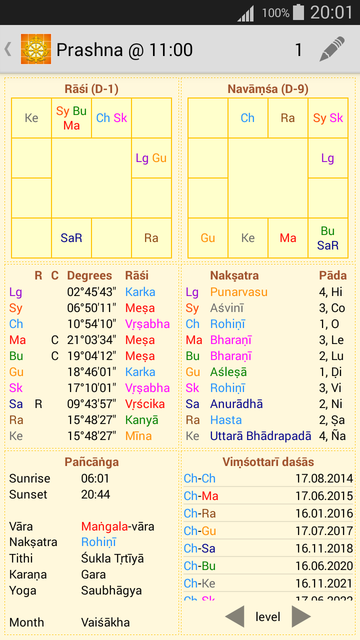 Chakra Darshana is an Android™ application for Jyotiṣa, Vedic astrology. It is available on Google Play™ in two flavors: a full version, providing the complete feature set, and a free version for working with praśna, current gocara, and viewing essential horoscope information. Chakra Darshana is used by both students and professional astrologers. It performs all calculations on your mobile device and, combined with support for desktop software, makes astrological information conveniently available everywhere. Designed to work on both phones and tablets (see screenshots). Copyright © 2015-2017 SIA "Jagannatha Chakra"